Signing up for a gym is generally a good thing -- it's a step in the right direction toward prioritizing your own health. And yet, there are lots of crappy gyms out there filled with crappy people. No one wants to spend an hour of their day surrounded by 'roid-pumped muscle douches like Chad from The Bachelorette. If your gym is filled with them, it's probably time to consciously uncouple from your strength-training facility. Sadly, muscle douches aren't the only reason to cut bait from a gym. As someone who managed gyms for seven years, I can tell you there are a few other clues that it's time to take your business elsewhere. And not because it's the latest (totally weird) weight-loss cleanse, but because your gym fees are so high you're literally going broke. If you're paying more than $150 per month on a gym or workout studio (and that's a lot, folks), it's time to find something more reasonable. The lighting is weird, the mirrors are cracked, and you really can't tell when the bathrooms were last cleaned. Going barefoot is a surefire way to end up with a foot fungus, and you never know where to put your bag to keep it from sprouting mold. There's also a lingering scent of sweat mixed with mildew overlaid with spray-on deodorant. Sure, some of it might still run, but the lifecycle of commercial cardio equipment is about seven years. If you're cycling on a Schwinn upright bike with moving arms and a fan built into the front wheel, I'm here to tell you that you deserve better. If there are machines with "out of order" signs on them for more than two weeks… or worse, there's equipment that's been out of order without any posted notices, you better believe you've got a gym with lazy management. Well-run facilities should have maintenance staff on call to address problems in a timely fashion. Even on the rare occasion where a part is backordered and will take longer to repair, it takes about five minutes to make and print a sign that communicates that information to members. 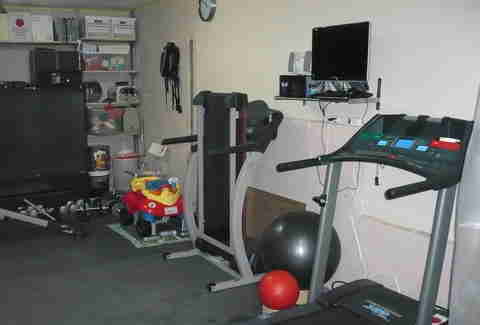 You're paying for use of a facility, which means you should be able to actually use the equipment the facility provides. 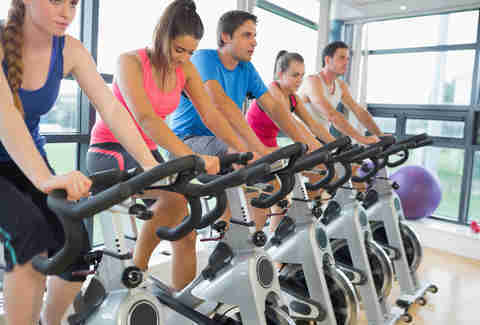 If battling your way through hordes at the gym is now officially part of your workout plan, and finding a spot in your favorite class feels a lot like The Hunger Games, your gym has probably oversold its membership. There's an actual formula gyms use to determine how many members they can comfortably accommodate, but it's not uncommon for management to get greedy and keep signing people up. This strategy might work when airlines do it -- they can offer free tickets to passengers they have to bump to a later flight. When gyms do it? You just end up waiting an extra 30 minutes to take a turn on a treadmill. The gym is the only one that wins. Ah, the joys of a highly unregulated industry. If trainers at your facility hold a "certification" provided by the facility itself, with no other fully vetted and accredited certifications to their names, be very cautious about listening to their advice. Anyone can throw up a dumbbell and call themselves a trainer, and any facility can put together their own class for employees to "certify" them. This doesn't mean the information they're providing is accurate or based on scientific research. As in protein powder, metabolic boosters, or mysterious shakes and pills the gym staff assures you are necessary to maximize your gains at the gym. Now, don't get me wrong, there's certainly a place for supplements. But that place isn't as an up-sell with a giant commission to your trainer or sales advisor who is almost guaranteed not to hold a certification in nutrition and has no place telling you what supplements you should take. Be very wary of any facility that encourages its staff to promote products that are outside of their scope. Even 'roid-pumped muscle douches like The Bachelorette's Chad have their tribes -- typically other muscle douches and a smattering of skinny teenagers who hope to one day grow similarly oversized muscles. If you're a dedicated runner who wants to strength train on the side to improve your sport, why would you sign up for a membership at a gym that attracts bodybuilders? Or, on the other hand, why would a serious weightlifter sign up for a membership at a gym that caters to 30-something stay-at-home moms? Now, obviously there's going to be a wide range of people at any gym; this isn't to say that you can only work out with people you like; getting along with the guy on the neighboring squat rack isn't a requirement of gym membership. But gym culture has a way of developing around its membership base, and if it gets out of balance, there's usually no turning back. If your "tribe" -- the types of people you tend to enjoy spending time with -- is nowhere to be found, then it's worth looking around for another gym. Sure, that $10 monthly membership you signed up for seemed too good to pass up, but if the gym is more than 10 minutes from your home or office, you're never going to go. Like, ever. 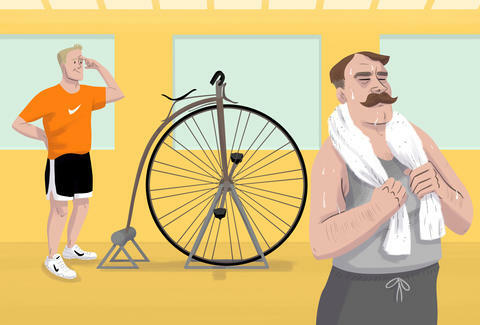 The only good gym membership is the one you'll actually use. And you'll only use it if it's convenient. Ditch the deal and find something closer to home. Laura Williams is an exercise physiologist and fitness writer who is pickier about gyms than she is about, well, pretty much anything else. Share your gym horror stories on Twitter: @girlsgonesporty.